The new and the ongoing highlight some recent clever extras from researchers and school students. The Sydney Morning Herald recently reported on an air conditioning attachment that used wastewater produced by the main unit to lower the air and refrigerant gas temperatures allowing the air conditioner to still operate but with far less energy. This retrofit, the IP Kinetik, devised by PhD student Vahid Vakiloroaya and developed by Independent Products won the Smart Cities Award Australian Technologies Competition (ATC) 2016. The Young ICT Explorers National Award for Years 5-6, caught the eye for its usefulness. It was for a washing line system with a weather sensor coded to use the weather forecast from the web to make the line retract if rain is approaching. For young and old, and anyone visiting New York soon, April will have a repositioning of well-known buildings, 300 miniatures and 1000 model trains at Gulliver’s Gate on the Ground floor of former New York Times building, in Times Square. The real-life (and nearby) Grand Central Terminal, will be one of the featured buildings. 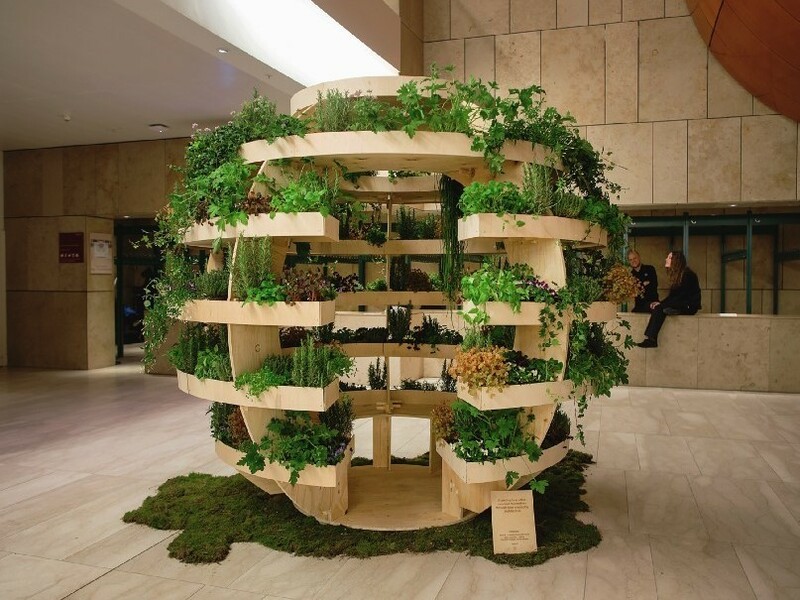 A flat-pack garden from an innovation hub Space10, working alongside architects Sine Lindholm and Mads-Ulrik Husum, connects with nature via an open source design that once opened out is described as a sphere-like structure for growing food vertically. The water flow and light reaches plants and herbs at every level. Its footprint is small, and it can be built with just a rubber hammer, 17 sheets of plywood and a CNC milling machine. One aspect of the resurgence of cycling in Beijing is the growth of bright blue, yellow and tangerine shared bikes from a bunch of technology start-ups. Download the app, transfer a deposit, pay per ride for the individually coded bike and then leave it wherever you want; they are usually used to take people from their public transport stop to their final destination. Meanwhile, end-of-trip facilities grow here and Sydney’s Barangaroo South is said to be the largest bike-parking facility in the southern hemisphere. So, that is how kudos is earned these days. Yet fewer than half of Australian travellers believe that our roads are “relatively safe” and reduced numbers have confidence generally in transport in their local area, according to the quarterly Transport Opinion Survey from the University of Sydney Business School’s Institute of Transport and Logistics Studies. There are state variations. Nearly 20 per cent of West Australians said there were up to three accidents on their regular travel routes per month while only 11 per cent of South Australians reported the same numbers. Telling us what we perhaps already know, the survey also found that very few travellers have faith in their government’s ability to ease congestion or improve public transport over the next 12 months. Nature has inspired Sustainable Living Fabrics’ palette Sustainable Classics the “soft, muted” colours of the Australian bush. The Design Writer’s Penny Craswell (February 2017), after talking to seven architects and interior designers about the character of Australian design, noted that our approach to architecture reflect the outdoor lifestyle, natural beauty, history and culture here. Secret Women’s ART exhibition features the work of eight contemporary Australian female artists some of whom have never had the artworks on which they have been working for months or even years shown before. Platform 72 in St Leonards celebrates the courage and strength of following the need for creative expression. The exhibition runs until April 8. After speaking at the 2017 Architecture Asia Pacific Symposium at the State Library of Queensland. Japanese architect Shigeru Ban’s first Australian project is being shown at the Sherman Contemporary Art Foundation’s courtyard garden and gallery space. Ban’s disaster relief shelters; one from Kobe (1995) the other for the Ecuador earthquake (2016) reveal his humanitarian approach to architecture.